Jun 9 Interviews With Cats: Tonks & Lupin, Two Fun-Loving Kitties Full Of Witty Banter! Thursdays are for talking to the coolest cats around, and today's "Interviews With Cats" is no exception! We got a peek inside the world of two Harry Potter-loving kitties - Tonks & Lupin - who you may know from IG as @mrfuzztonksandlupin. Two of the silliest kitties around - we didn't think it was possible to love them more! Q: Tell us about yourself! Name, nickname, age, city, siblings, etc. Lupin: I can introduce myself Tonks! Hi, I’m Lupin! Tonks: Fine Lupin, but let me finish, okay? We live in Sherman Oaks, California and we are adoptive siblings. I was born July 3, 2013. My nicknames are: Tonka Truck, Tonka Bean, Tonky, Tonkers, Tonkalina, Tink, Tonkalonk....clearly our purrents are nuts. Lupin: I just had my first birthday on May 30! My nicknames are: Looper, LoopyPoops, Loopykins, LoopyPoopers, Lou, and LouLou. Q: Is there a special story behind your name? Lupin: HEY! You didn’t have to tell them! Tonks: Well it was your name! It WAS his name! His name was Jamie when HuMom adopted him from Best Friends Animal Society in Los Angeles. She promptly changed it to Lupin. We are named after Nymphadora Tonks and Remus Lupin, the Aurors and members of the Order of the Phoenix from Harry Potter! HuMom even had art commissioned of us as Tonks and Lupin by our friend Tatiana! Lupin: For me, I think it was getting adopted, but to be fair, I haven’t been around THAT long...I was super shy in the shelter. I still am really shy in person. I was hiding sort of near the back of my enclosure but I was making steady eye contact. HuMom took note of that because most cats WANT to get out and make a big scene out of it, you know? So she asked our friend Samantha, the behavioral expert at BFAS about me. She told HuMom that once I was out of that cage I was the most snuggly, sweet and purr-tastic boy ever. Then she told HuMom I had been there for 2 months! ME! I was 5 months old and really adorable! So she knew she had to rescue me! Tonks: Well, not to sound like a broken record, but ditto. The day HuMom showed up at AdoptNShop and came into the visiting room. She sat down to see who came up to her. And I did over and over again! She visited with some other kitties and went out to see some others, but she kept coming back to me. She took me home that very day! I wasn’t a kitten or anything and HuMom wanted to adopt an adult cat. But CatDad had never had a cat before and wanted a kitten, so they “compromised” and got me since I was a very small one and a half year old cat. Don’t tell CatDad, but it wasn't a compromise since HuMom totally got the cat she wanted (and I got who I wanted too). Q: What’s your favorite treat? Lupin:Ciao Cat Treats! Think GoGurt for Cats without the yogurt but tastier and healthier! Oh and I REFUSE to eat food without Nature’s Variety Instinct Raw Boost Mixers! They’re freeze dried nuggets of chicken or duck or rabbit that HuMom puts on top! Tonks: You know, I’m sort of a classicist. My favorite treat is my Tabby James organic catnip! I prefer to eat the Regular cut straight out of the jar, which is certainly not the usual way most do it, but I like to keep it interesting! Lupin: Every time I use a scratcher HuMom yells at me....I mean everything is a scratcher, right? Tonks: No you big lunk, there are like a dozen special things around the house JUST for scratching! She sprays you with the squirt bottle when you scratch the carpet or any of the rugs. We are VERY lucky our family is anti-declawing with a knuckle-head like this guy around. But he’s still learning; I always use the scratchers and we both get our nails trimmed by HuMom. You know I’ll be honest, I can’t recall actually getting in trouble with HuMom or CatDad aside from when we end up playing a bit too roughly and I always get the blame. Q: What’s your favorite holiday and why? Tonks: Well first, I can tell you what my favorite holiday isn’t! Halloween! HuMom bought two costumes to send to one of our besties @sophie_the_model. One was a mermaid costume and the other was fairy wings. Lupin: Do you seriously have to bring this childhood trauma up? Tonks: Ugh, anyways, HuMom puts these wings on me. They go under my arms and I DON’T like them. I launch myself backwards into CatDad’s collectible bookshelf trying to get them off and you know what she does? She LAUGHS and then takes photos! Our disaster photo from trying on the fairy wing costume…. Lupin: Then she very quickly took them off of you Tonks....And put them on me! Once she realized that I wasn’t a fan, she took them off. But not before I bit them and ruined them! VICTORY! Tonks: But she didn’t subject you to the stupid mermaid costume too. Lupin: *awkward silence* Um, so my favorite holiday is Chrismukkah because we have stockings and get gifts and light the Menorah! Tonks: Yeah! We celebrate both Christmas and Hanukkah here so we get ALL the goodies! Lupin: I'd like to be an anti-declawing spokes-cat for something like the Paw Project and help get declawing banned in the United States. Tonks: I think it would be great to work for shelters teaching people about adoption and the importance of spaying and neutering. Q: What’s your favorite toy and why? Lupin:THE CAT BALL. That thing is AMAZING. It’s a bed AND it’s a toy! I roll around in it, I run over and crush Tonks when she is sleeping in it, we jump through it, we sleep in it....It’s just so awesome! 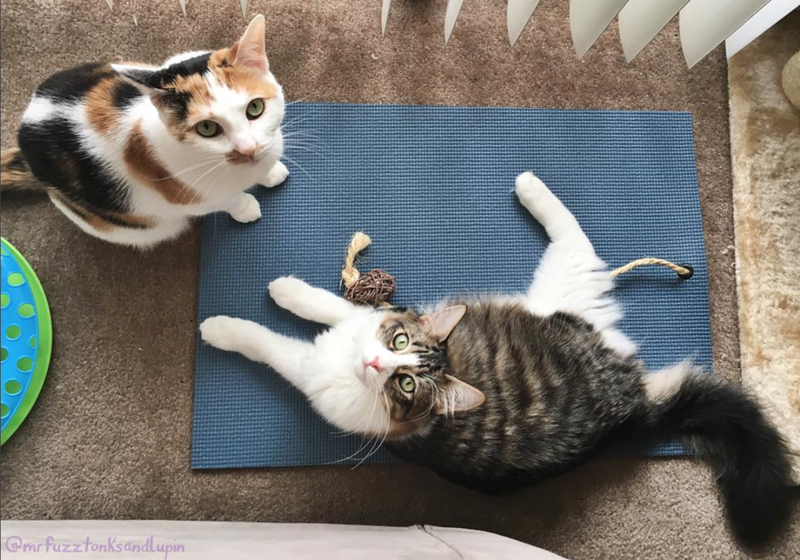 Tonks: We love our Polydactyl Cat Toys! One of our besties Randi owns and single handedly runs the company. We have so many fun premium nip toys shaped like our humans favorite foods: soy sauce, sushi, tacos, hot sauce and even popcorn! Q: Do you have any special talents you’d like to share? Tonks: I always say “bless you” whenever someone sneezes. I’m really good at unraveling the toilet paper roll. That’s why it’s not on the roller anymore and the bathroom doors around here and kept closed. Lupin: I’m handy with my paws. I try to eat with them when HuMom hands me a treat. I don’t know if it’s a talent, but I think it’s pretty special. I like my tummy rubbed! Q: What do you do that annoys your parents? Tonks: See above question about special talents and my aptitude for toilet paper unraveling. The parents seem to take issue with unraveled, moist toilet paper with bites taken out of it. Who knew? Lupin: I’m still getting a hang of this whole “there are certain places to scratch” thing. When I get excited I’ll scratch the carpet. And no one but me seems to appreciate that. All of a sudden I’ll get picked up and plopped on a scratching post... Like, what’s up with that man, was I bothering you or something? And, apparently, the answer is yes. Q: Do you have a best friend(s)? If so, who? Tonks: My Valentine this year was George of @tinaf78 and Wheezy is a good furriend too. I love Romey’s HuMom’s arm...their accounts is @hussycats! Ghetti-O of @albieluckdragon is my homegirl! 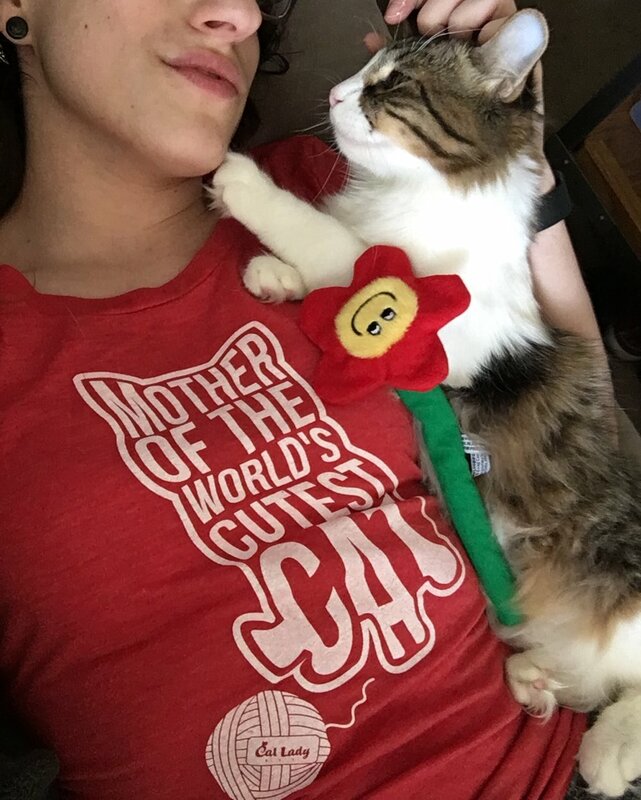 I’ve been her furriend since she was an itty bitty kitten. My sister from another Mister and her sister @oliveandrye! Lupin: We love our pals Roswell and Rask over at @roswell_the_cat. Perry and Monty of @yanksgal23 are close furriends, as well as the three tuxedoed ladies of @_porkchopthecat_. I love Fonz and Hitch of @chunkyfonzandhitch, particularly the fun catnip toys their HuMom sends us! And then we have three international besties: @hellvia in Italy, @spiketownboy in Canada, and @bobbyandsadie in England. Ummm, HuMom is now signaling to us that we aren’t allowed to named ALL of our Instagram furriends. Tonks: That seems VERY unfair! We actually love all of our friends. We try not to add too many friends because we strive to maintain a relationship with everyone. Q: Do you have a favorite pastime? Lupin: Well let’s see. I like napping, eating, napping, grooming myself, napping, grooming Tonks, napping, grooming HuMoms head, napping, snacking, playing with toys, looking out the window and napping. Tonks: I like eating, napping, grooming myself and Lupin, napping, making biscuits on blankets, scratching the scratching posts, chirping at squirrels, making biscuits on CatDad, napping, unraveling toilet paper, making biscuits on my bed and napping! Both: Yes! Please consider spaying/neutering and vaccinating your pets! Low cost and even free services may be provided in your area! If you need help and you are unsure where to go or maybe searching online seems intimidating to you, message us on Instagram! We have several resources we can share with you and sometimes it can take as little as a day to help you find a low cost spay/neuter and vaccination clinic near you. Many times financial aid is available and is not that complicated to fill out! Help is available and we are here. spayusa.org can help you locate a program near you. You can also Google “low cost spay neuter program.” This is also why we encourage everyone to Adopt Not Shop! Just look at us adorable adopted kitties, you can’t buy love like this! Image Credits: Images courtesy of Stacy, Tonks & Lupin's wonderful meowmy! Jun 13 North Toronto Cat Rescue Set For Demolition And NEEDS YOUR HELP!